The economy deteriorated in 1971 and 1972. The most important indicators of this were rising inflation, a lack of foreign currency reserves, a trade deficit, and meat shortages. Labor strikes, demonstrations, increasing violence and police torture, and terrorist attacks and counterattacks were widespread. There was a general climate of disintegration and the threat of a major national insurrection unless the government allowed free elections to take place in 1973. Prior to the 1973 elections, the government established eligibility requirements for all presidential candidates, including residence in Argentina before August 25, 1972. 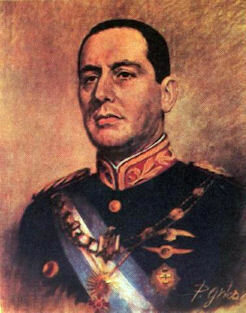 Perón refused to comply with the residence requirement or to declare himself a candidate, although he arrived in December to carry out political negotiations. Instead, he appointed Hector J. Cámpora candidate of a coalition of the Peronist Justicialist Party (Partido Justicialista—PJ) and a large number of small parties. On March 11, 1973, Cámpora won 49.5 percent of the votes in the presidential election following a campaign based on a platform of national reconstruction. Riding a wave of mass support, Cámpora was inaugurated on May 25. The military conceded Cámpora's victory, but strikes, as well as government-backed violence, continued unabated. Cámpora and his coalition supporters refused to intervene before the inauguration. After years of repression, the Peronist masses were delirious at the inauguration. The slogan "Cámpora in government, Peron in power" expressed the real source of popular joy, however. Campora's short tenure brought a few popular measures: a general amnesty was declared for all political prisoners, university officials sympathetic to student grievances were appointed, a price freeze was declared on basic food items, and diplomatic relations with Cuba were reestablished. Peron returned to Argentina on June 20, and his arrival brought about an unexpected crisis. At Ezeiza International Airport an estimated 2 million people gathered to welcome Peron. Bullets were exchanged among the demonstrators and between them and the security forces, leaving several hundred people dead and over 1,000 injured. Perón arrived instead at a military base, and on a television broadcast that evening he condemned the demonstrators. Peron delivered a final blow to the Argentine youth movement on May 1, 1974, when he called it "stupid and mercenary." Increasing violence and a lack of support from Perón forced Cámpora to resign in July, and he was replaced by Rañl A. Lastiri, president of the Chamber of Deputies, who scheduled new presidential elections for September 23. Perón won 61.9 percent of the vote and, with his wife Maria Estela (Isabel) Martinez de Peron as vice president, was inaugurated on October 12. In his second period in office, Perón was committed to achieving political peace through a new alliance of business and labor to promote national reconstruction. Perón's charisma and his past record with respect to labor helped him maintain his working-class support. In early 1974, however, the economy was on the brink of collapse. As in the 1950s Peron resorted to foreign borrowing in order to subsidize consumption, thereby producing huge budget deficits. Workers' real wages continued to drop as regular wage increases did not keep pace with the rising cost of living. By early 1974 the Peronist restoration had lost the support of the trade union rank and file and its more militant followers among students and intellectuals. To control workers and activists, the administration resorted to police actions, and a series of reforms of the Penal Code provided the government the legal means to institutionalize the repression. Popular demonstrations became illegal and subject to police intervention; political exiles were repatriated or repressed in Argentina; and the media were placed under state control. Peron was nevertheless able to hold onto his office until he died suddenly on July 1, 1974.